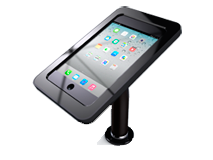 iPad mini Desk Stand Lockable Kiosk is equipped with a lock allowing easy access to the tablet for the authorized personnel. 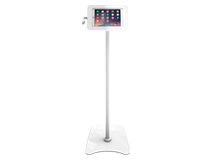 This iPad mini Desk Stand or 7,85″ – 8″ Tablet Kiosk is meant to be mounted on low height horizontal surfaces such as desks, counters, coffee tables etc. placing the tablet screen under 30° angle towards user. It is designed for easy installation and high security for tablet used in business and public. 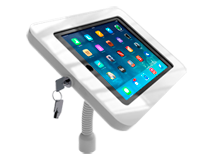 Being completely tamper-resistant iPad kiosk is a perfect platform for interactive catalogues, restaurant menus, traveler’s guides, pricelists etc. iPad mini Desk Top Lockable Kiosk is equipped with a lock allowing easy access to the tablet for the authorized personnel. 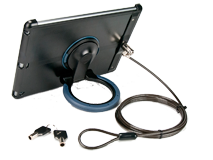 Protected from theft, iPad mini or 7,85″ – 8″ Android Tablet mounted inside the enclosure can be safely deployed at public, retail or hospitality setting. 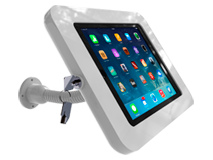 Being completely tamper-resistant iPad mini kiosk is a perfect platform for interactive catalogues, restaurant menus, traveler’s guides, pricelists etc.